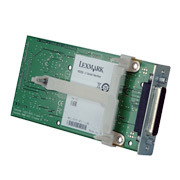 The 2400 Series Serial Interface is for use with the Lexmark Forms Printer 2400 Series and is installed inside the printer. A serial cable is not included. The serial adapter utilizes a standard 25-pin D-shell female connector and supports baud rates up to 19,200 bps. It can be connected to most systems that support an RS-232C interface. Serial baud rates range from 300 to 19,200 bps.